Auction123 provides the most comprehensive suite of website development, inventory management, and online marketing solutions available to commercial truck and trailer dealers. There is no other software provider serving the commercial dealer community that offers better tools for generating leads and marketing your dump trucks, box trucks, busses, or trailers online. Auction123 is an award-winning website provider offering professional website development for commercial truck and trailer dealers. Let us work with you to create your dealership’s custom branded site complete with content editing tools so you have the control to make changes anytime. 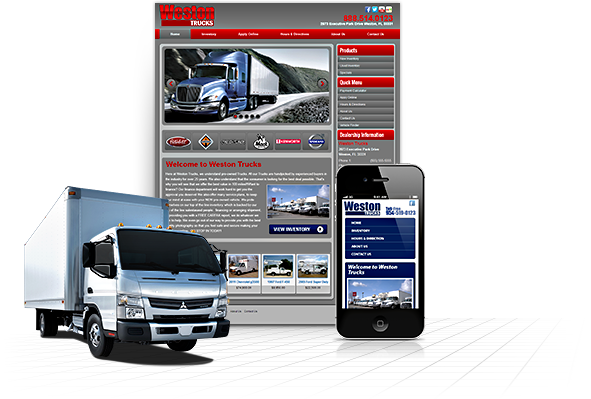 We understand how important it is for commercial truck and trailer dealers to have a mobile friendly web presence. Our mobile websites and mobile inventory showrooms display all the images, descriptions, and details of your commercial inventory. Auction123’s inventory management solutions provide commercial inventory and trailer dealers with everything they need to effectively manage inventory including tools like our data management controls, detailed unit marketing emails, and inventory reporting. As an eBay Motors Preferred Solutions Provider, Auction123 offers the best eBay listing software available to commercial truck and trailer dealers. Turn eBay into your dealership’s #1 source for leads with customizable eBay templates and powerful bidder contact information. Auction123’s Craigslist Posting tools for commercial truck and trailer dealers provide the ability to easily list inventory. Post via our Craigslist application for a more automated process, or utilize the copy/paste method to gain access to the HTML code for your ads. 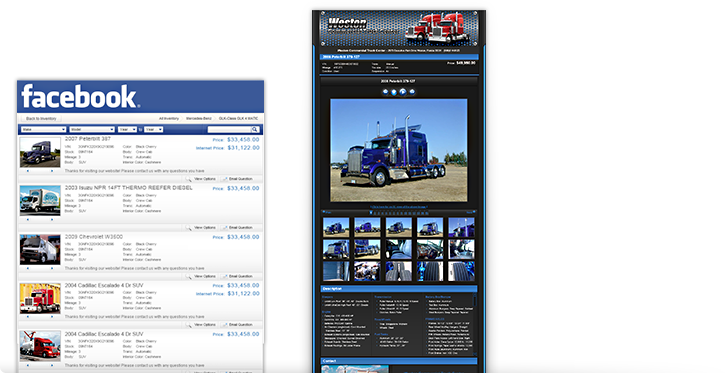 Our award-winning Facebook inventory application provides a Facebook inventory showroom plus wall posting functionality so you can choose exactly which trailers and trucks you want to market directly to your Facebook fans. Auction123 can import commercial truck inventory data from virtually any provider who can send us a file of your units and images. Even manually building commercial or trailer inventory into the Auction123 system is a breeze. Auction123 supports the distribution of your horse trailers, boom trucks, sleeper semis, and other inventory to over 400 online marketplaces, classified sites, and service providers. Keep your big rigs and trailers looking their best with our easy-to-use inventory enhancement tools including a bulk image uploader with photo editing functionality, a description management system, video marketing solutions, and customizable inventory templates. Quickly print custom window stickers for your commercial trucks on demand from the Auction123 system. Our graphics department will work with you to create a professional window sticker design. QR code stickers are available and will link to a mobile friendly unit presentation.